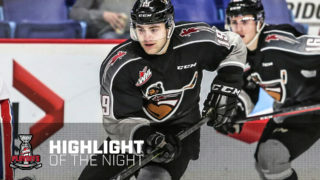 Saturday night in Everett, WA the Vancouver Giants were defeated 5-0 by the Everett Silvertips. Five different scorers paced the Silvertips attack who posted 50 shots on the Giants net. Philadelphia Flyers prospect Carter Hart turned aside all 23 shots he faced to earn his 26th career WHL shutout, matching the mark set by former Giant Tyson Sexsmith. Giants goaltenders David Tendeck (38 of 42) and Trent Miner (7 of 8) combined for 45 saves. Fresh off a dramatic 2-1 overtime victory at home Friday, the Giants, who had seven regulars out of their lineup due to illness or injury, played a strong first period against the Western Conference leaders. Carter Hart was forced to make some difficult saves in the opening period and got some help from his goal post too. Ty Ronning nearly potted his 50th of the season off a shorthanded breakaway, but he shot rang clean off the post to keep the game scoreless. David Tendeck was superb at the other end for the G-Men as he denied all 13 Everett shots. The teams traded chances for the first half of the second period with neither goaltender relenting. 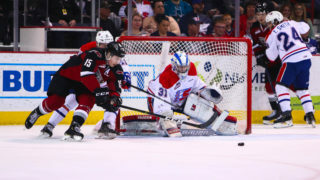 Ty Ronning had another point-blank chance denied by the glove of Hart off the rush which kept the Giants blanked on the scoreboard. Ethan O’Rourke broke the scoreless tie at 11:42 for Everett when he used his size to knock an airborne puck down with his glove. He then quickly snapped a low shot through the legs of Tendeck and home for his sixth of the season and his first in an Everett uniform. Just under three minutes later Everett extended their lead when Sean Richards charged the net hard and redirected a right-wing feed from Patrick Bajkov past David Tendeck for his 19th. Shots through two periods were 31-19 for Everett who had a 2-0 lead. The home side tacked on three more goals in the final period, including two in the first 5:38. First it was Matt Fonteyne who knocked home his own rebound from in close past the left pad of David Tendeck for his team-leading 31st. Then at 5:38 Ian Walker scored his first of the season from a similar spot in close which spelt the end of the night for David Tendeck. In came rookie Trent Miner to wrap up the remaining 14 minutes and change. He finished the night seven-for-eight. The only puck that got past him came via Bryce Kindopp off a shot from the left-wing that deflected off a Giants defenceman and in. After 60 minutes the final shots were 50-23 for the Silvertips who held on to secure the 5-0 shutout victory. It marked their 35th victory overall and their 21st victory at home. The loss marked the 18th of the season for the Giants overall and their 10th on the road. 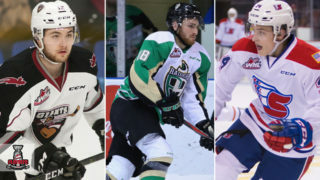 The Giants now sit five points back of Kelowna for second in the B.C. Division and 10 points ahead of Kamloops for third. Everett remains two points up on Portland for first in the US Division and the Western Conference. Neither team capitalized on the power play as the Giants finished zero-for-four and the Silvertips went zero-for-five. 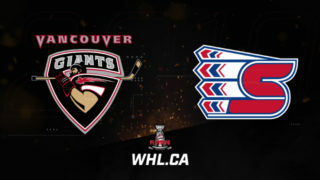 Next up for the Giants: A trip to Portland to face the Winterhawks on Wednesday night at 7:00 PM. – The Giants played Saturday’s game with eight regulars missing from their lineup due to injury/illness. 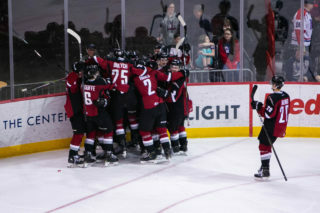 – Ty Ronning remains one goal shy of 50 for the season, and two goals back of league-leader Jayden Halbgewachs of the Moose Jaw Warriors. – The Giants penalty-kill is now perfect in its past six games going 21/21 in that span.